PSP Fall Tutorials: Make a Vector Evergreen Tree! 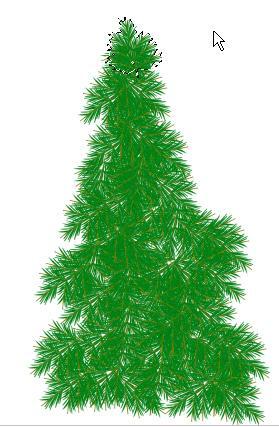 Use the vector line drawing tool in PSP7 to create an evergreen branch. Create a tube from the branch then build a whole tree using the tube. Please note: With a lot of rather large graphics, this page may load slowly. With the holiday season in full swing, I thought today we would finish off our Fall Clinic by making an evergreen branch, making a tube from the branch, then using the tube to build a Christmas tree. 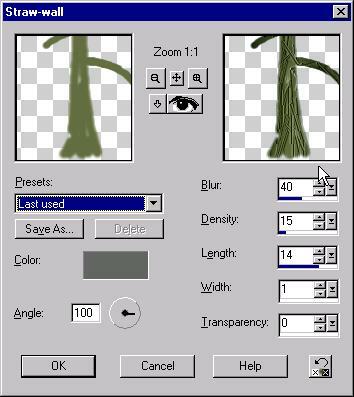 Anyway, we will use the vector line drawing tool in Paint Shop Pro 7 to draw an evergreen branch. 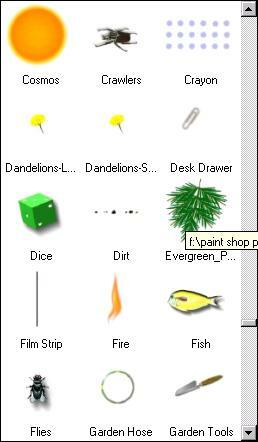 Open a new file in Paint Shop Pro by pressing the new file icon on the Tool Bar, or by clicking the word File and NEW from the Menu bar. To give enough room to work with, pick a size about 400 X 400 pixels and resolution of 72 dpi. 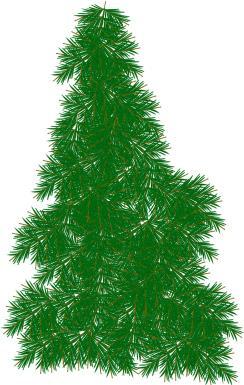 Use a background color of white and Press OK.
Let's draw this evergreen branchlet as the first part of our image. Don't choke, folks. With paint shop pro's vector tools we can do this without any art ability at all! OK. Pick the Vector Line tool from the Tool Palette, third icon from the bottom. Set the foreground stroke Style to solid by clicking the right facing arrow next to the color swatch under the color picker. Pick the first choice there. resemble the image on the left. On the Tools Options Palette, pick Freehand Line as the Type, Width of 2, and line style of Solid. Check all the underlying boxes, Antialias, Create as vector and Close path. Draw a simple line about an inch long. It might take a few UNDO's but try to make it slightly curved fairly smooth. If it comes out a bit short, use the Vector Selector tool to lengthen or short it. Next make the individual needles. on the color swatch itself. With the same settings as before on the Tool Options palette, draw a few needles out from the brownish stem. Remember, if you don't like one, you can either change it by using CTRL + Z on the keyboard, or UNDO on the Tool Bar. Also, change to the Vector Selection tool to resize other needles. When you have an assortment you like, say 5 or 6, pick the Vector Selection Tool. Select a needle by clicking on it in the image. Then right click and Copy then Right click off the selected needle and pick Paste as a new vector selection. Continue selecting, copying and pasting the needles until there are enough to fill out the branchlet. With the vector selection tool, resize each needle to fit its space, and rotate using the middle handle and position along the brown stem. Open the layer palette if it is not showing on the screen by clicking "L" on the keyboard or using the red and blue toggle layer palette icon on the Tool Bar at the top of PSP. After making all the needles and copying and pasting the layers should look is something like this. Layer one, when expanded has all the little needles and the stem as freehand items. It might make good sense to find the stem object, right click on it and rename to Stem. If you want to move any of the needles under the stem, drag and drop the individual "freehand" needles beneath the stem layer. Next, group everything on the layer. PSP7 gives us Grouping power! In the image, with the Vector Selector tool, drag a box around all the needles and stem then right click and pick Group from the fly out box. On the layer palette right click on Group and rename it to Branchlet. See below. We are just about finished drawing. One more thing then we will be done with this part. With the vector selector tool, move branchlet group up out of the middle of the image. Pick the Line drawing tool. Make sure layer 1 is selected on the layer palette, not the group. Right click the Stroke color swatch to bring up a small palette of recently used colors. Find the light brown (will show the RGB colors of 130, 116, 0 when moused over) and click it. Right click the Fill color swatch and set that to the darker brown, 116, 90, 0. Drag a 3 inch line sort of on the diagonal. On the Layer Palette, expand layer 1 and rename lone freehand thing to Main Branch Stem. With the Vector Selector, pick the Branchlet group and the right click on it and copy from the flyout box. Right click in the image not on the objects and pick Paste as new Vector selection. Keep right clicking and pasting this branchlets until there are a total of 7 showing. Mostly likely there will be a mess on the screen sort of like on the left. NOTE: If your computer gets balky, stop at 5 branchlets. Select each branchlet in turn with the vector selection tool. Move and rotate into some meaningful position along the Main Branch stem. Resize the individual branchlets as necessary. Try for a configuration like this. Save this file as Branchlet.psp for any future use. Remember,since it's purely a vector drawing, at anytime you can go back and change every single teeny part, right down to the stroke color on the first needle by selecting the part in the layer palette, and getting its properties. However, what you cannot do with a vector drawing is add effects or color adjustments to it. (Except for Adjustment layers ) End of part one... Any questions? After saving the file, clear the clipboard and the command history to free up memory if your computer is running slowly. Go to Edit on the Menu Bar and Empty... Clipboard and then same for Command History. Make the Grid visible by clicking on View on the Menu bar and Grid on the fly out box. Let's change the grid properties to set up our tube. With the new image selected, click on VIEW again and then Change Grid and Guide Properties. On the Grid and Guide Properties dialog box, change the default 10 pixel spacing in both Horizontal and Vertical to 200. I also changed the Line color to a light grey from the default black. Less distracting, IMHO. Click OK to close that box. Note below how the grid lines change giving 3 equal boxes. HINT: Our tube will be 3 cells. Switch back to the branchlet image by clicking on its title bar. Notice that PSP didn't change the default grid spacing on this image... A new PSP7 feature. Pick the Vector selection tool at the bottom of the Tool Palette. Select Layer one on the layer palette then press the copy button on the Tool Bar. Pick the Vector Selection tool at the bottom of the Tool Palette then select Layer one on the layer palette then press the copy button on the Tool Bar. Switch to the new image and right click on its title bar picking Paste as New Vector Selection from the flyout box. A rough outline of the branchlet will appear stuck to the cursor. Click to drop it anywhere. A rough outline of the branchlet will appear stuck to the cursor. Click to drop it anywhere. It might take a few seconds for the image to appear in the window. Please be patient. Yes but its vector we can fix that. Expand the whole image by grabbing the bottom corner of the image window and drag outward until the bounding box shows for the pasted branchlet. Grab a corner handle (make sure the vector selection tool is picked) and resize the branchlet smaller to fit into a cell. Move it to the first cell on the left. Because it's vector, it will shrink and grow without losing clarity and quality. Right click on the branchlet and copy, then right click elsewhere and paste as new vector selection. Position this one in the middle cell. Repeat one more time for the third object placing it in the last cell. It takes a while to get visible after you paste it in, even on a fast computer, be patient. Save and close the original branchlet.psp image as we won't need it again today. Save the new image now as pretube.psp, just in case. Again to free up memory, empty the clipboard and the command history. Marquee select the whole branchlet in the left cell using the Vector Selection tool. Rotate and resize until it is basically points up and down. Marquee select the whole branchlet in the second cell and rotate until it points obviously to the left. Repeat with the third cell until it points to the right. Make sure all the branchlets fit within the boundaries of the cells. The 3 Celled pretube file should look similar to mine below. On the layer palette select layer 1. Right click and convert to raster. It might take a few seconds. Please be patient. OK.
Click the eye icon on the layer palette next to the Background layer to turn it off. Make any color adjustments to the Layer 1 now. For example I added a little noise and applied an unsharp mask to give the needles some texture and depth, then shifted the greens a bit more bluish. Save the pretube again. We are ready to Tube! Pick the background layer on the Layer palette, then right click and delete it. Only Layer 1 should be showing. In the Image, note the 3 cells against a checkerboard background. Go to File, Export, Picture Tube from the Menu bar to bring up the Tube Export Dialog box. Set the Placement Mode to Continuous. Set the Selection Mode to Incremental. Leave the step size at 200. Type in a name for the tube like Evergreen Parts. The new tube should show up on the Picture Tube options on the Tools Options Palette. Close the pretube image, saving any changes if you need to. Part 3: Building a Tree using the Evergreen Tube. Open a new file, 640 X 480. On the Layer palette, right click the Background layer and make a new Raster layer. Name it Tree on the Layer Properties box. Select the Tube Tool on the Tool Palette. On the Tool Options Palette, find your very own evergreen tube from the drop down box. Make a test spray.. Oh, Oh, way too big. On the Options Palette, scale the tube to about 33 percent. Clear the image using UNDO until its white again. Bearing in mind that this tube works by spraying the images consecutively, left cell, middle cell, then right cell and so forth, build a tree from the ground up. If the first image you spray goes up and down, the next image will always be going to the left and the one after that will always be going to the right. Work your way up the tree placing branches as needed. It took me a few tries to get the rhythm of it, but its a cool trick. And easy once you practice it. At the top, note how all the branchlets point down. Create a new layer on the layer palette and spray one more image onto it. Preferably the up and down one. Grab the rectangular selection tool and make a selection around that piece. Drag the selection over the top of the tree. On the Menu click the word Image, then Flip from the flyout box. Use the Mover tool to move the selection down into position. Presto, tree topper. On the Menu Bar, click Selections, then Select None from the flyout box. Turn off the background Layer on the Layer Palette. Then right click one of the other layers and pick Merge, Merge Visible from the flyout box. That makes the tree top part of the tree layer. And the basic tree is done. If you like, create a new raster layer under the Merged layer. Name it Trunk. Then using the Paint Brush tool, and brown Foreground (stroke color), paint a suggestion of a trunk under the needles. Add any effects you like. For example, I added just bit of texture to the trunk layer using Effects from the menu bar, Texture Effects, Straw Wall, at the default setting. Finally merge the Tree layer and the Trunk layer. Then delete the background layer. 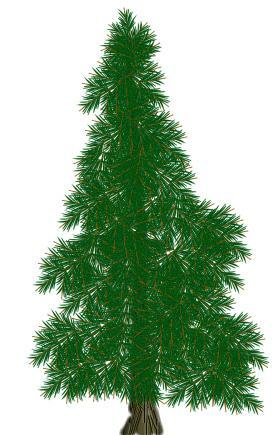 I cropped the image to fit the tree and saved as Xmas Tree.psp as an object to use in any future PSP project I need it for. 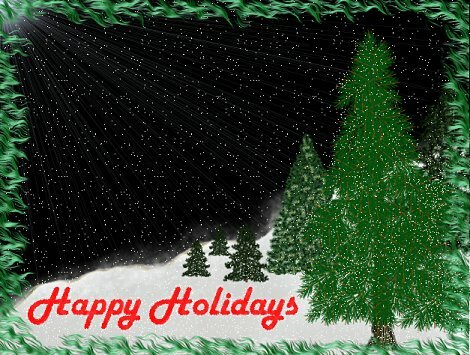 I worked it into the holiday image below with other tree tubes I have collected.